CrAzYbLoG: Mobile with foldable screen! Believe it... the cell phone of the dreams has came in. The term librofonino is a neologism (issue similar to tivufonino and videofonino) composed of crasis and phone book (but you might also consider -fonino as suffissoide, given the examples of PC-fonino, ipod-fonino, skype-fonino and even pistola-fonino). Designa a particular mobile device presented the world premiere of the 3GSM World Congress in Barcelona starting from February 12. It will be marketed in Italy during the 2007 Exclusive by Telecom through an exclusive agreement with the Dutch company Polymer Vision (development unit of Philips, which specializes in research and production of display thin as a sheet of paper), whose technology allows integrating mobile phones in a larger screen mobile phone, ensuring the reader a contrast similar to that of the printed word. The new model is based on a prototype of Polymer Vision called Readius, introduced in 2005, which also uses the technology of the screen panel and expandable: books and newspapers can be purchased online through the mobile network by Tim and then stored in memory electronic terminal (the first models already have 4 gigabytes). 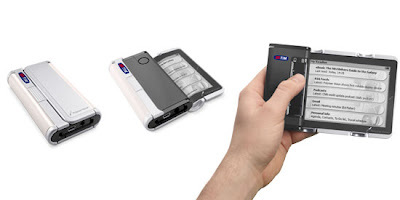 While Nokia announced an initial series of memory cards for mobile containing audio-libri, TIM-Telecom Italy Mobile challenge therefore the market with "librofonino", the first phone with removable screen that will see electronic books and newspapers online. The strategy prepared by Telecom Italy for the launch of the new product provides a number of agreements with publishing companies to provide content is likely to begin with the distribution of public domain. The librofonino "can also download and play MP3, access e-mail, consult geographical maps. The new device, which uses all the technology for connecting mobile broadband and energy autonomy of ten days, it works with a normal Sim Card.